Our team offers the most advanced cloud based bookkeeping and payroll services available. We are committed to meeting the demands of today’s business environment in the most effective and efficient manner. 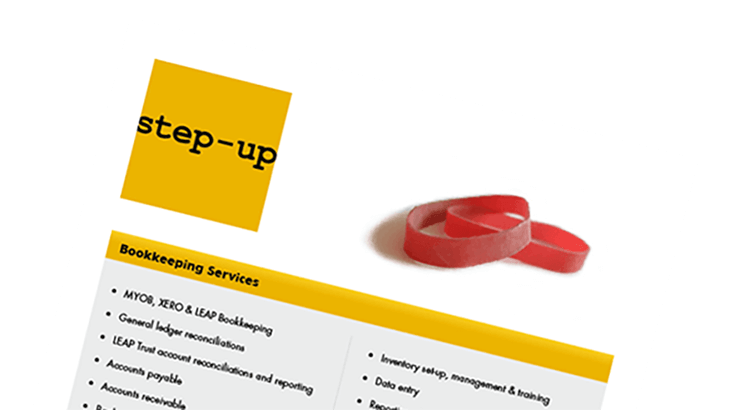 The Step-Up team keeps up-to-date with legislative changes, software updates and other developments that affect our clients. We will help you get setup for the STP 1 July 2019 deadline. Your business is unique and so too are your requirements. Accordingly our services are tailored to you – as comprehensive or as minimal as you desire. Maintain and update your accounts. MYOB, XERO & LEAP specialists. Trust accounts – Law Firms and Real Estate Agents. MYOB and XERO. We’re certified and we can teach you how it’s all done! To download a copy of our services brochure, please click here.